Definition at line 54 of file LiveIntervals.h. Definition at line 100 of file LiveIntervals.cpp. Definition at line 104 of file LiveIntervals.cpp. Definition at line 683 of file LiveIntervals.cpp. References llvm::MachineInstr::addRegisterKilled(), llvm::LiveRange::advanceTo(), assert(), llvm::LiveRange::begin(), llvm::SmallVectorImpl< T >::clear(), llvm::MachineInstr::clearRegisterKills(), llvm::LiveRange::empty(), llvm::LiveRange::end(), llvm::LiveRange::find(), llvm::LaneBitmask::getAll(), getInstructionFromIndex(), getInterval(), llvm::LaneBitmask::getNone(), llvm::MachineRegisterInfo::getNumVirtRegs(), llvm::VirtRegMap::getPhys(), getRegUnit(), llvm::TargetRegisterInfo::getSubRegIndexLaneMask(), I, llvm::TargetRegisterInfo::index2VirtReg(), llvm::LiveInterval::SubRange::LaneMask, MI, N, llvm::MachineInstr::operands(), llvm::SmallVectorTemplateBase< T >::push_back(), Reg, llvm::MachineRegisterInfo::reg_nodbg_empty(), llvm::RISCVFPRndMode::RUP, llvm::LiveInterval::subranges(), and llvm::MachineRegisterInfo::subRegLivenessEnabled(). Given a register and an instruction, adds a live segment from that instruction to the end of its MBB. Definition at line 868 of file LiveIntervals.cpp. References llvm::LiveRange::addSegment(), createEmptyInterval(), getInstructionIndex(), getMBBEndIdx(), llvm::LiveRange::getNextValue(), llvm::MachineInstr::getParent(), and getVNInfoAllocator(). Test if LI is live across any register mask instructions, and compute a bit mask of physical registers that are not clobbered by any of them. Returns false if LI doesn't cross any register mask instructions. In that case, the bit vector is not filled in. Definition at line 884 of file LiveIntervals.cpp. References llvm::LiveRange::advanceTo(), assert(), llvm::ArrayRef< T >::begin(), llvm::LiveRange::begin(), llvm::tgtok::Bits, llvm::BitVector::clear(), llvm::BitVector::clearBitsNotInMask(), llvm::LiveRange::empty(), llvm::sys::path::end(), llvm::ArrayRef< T >::end(), llvm::LiveRange::end(), llvm::MCRegisterInfo::getNumRegs(), getRegMaskBits(), getRegMaskBitsInBlock(), getRegMaskSlots(), getRegMaskSlotsInBlock(), intervalIsInOneMBB(), llvm::lower_bound(), and llvm::BitVector::resize(). Referenced by llvm::LiveRegMatrix::checkRegMaskInterference(), getRegMaskBitsInBlock(), and isACalleeSavedRegister(). 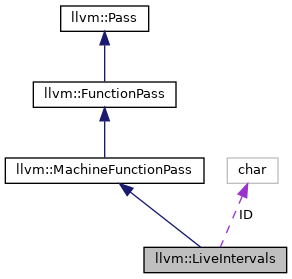 For live interval LI with correct SubRanges construct matching information for the main live range. Expects the main live range to not have any segments or value numbers. Definition at line 1654 of file LiveIntervals.cpp. References assert(), getSlotIndexes(), and getVNInfoAllocator(). Definition at line 137 of file LiveIntervals.h. Referenced by getInterval(), moveAndTeeForMultiUse(), moveForSingleUse(), optimizeVcndVcmpPair(), print(), rematerializeCheapDef(), and repairIntervalsInRange(). Definition at line 130 of file LiveIntervals.h. References assert(), llvm::IndexedMap< T, ToIndexT >::grow(), hasInterval(), and Reg. Referenced by addSegmentToEndOfBlock(), createAndComputeVirtRegInterval(), replaceRegUsesAfterLoop(), and splitSeparateComponents(). 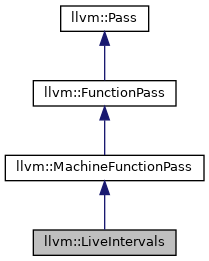 The points in the Indices array must be jointly dominated by the union of the existing defs in LR and points in Undefs. PHI-defs are added as needed to maintain SSA form. If a SlotIndex in Indices is the end index of a basic block, LR will be extended to be live out of the basic block. If a SlotIndex in Indices is jointy dominated only by points in Undefs, the live range will not be extended to that point. Definition at line 612 of file LiveIntervals.cpp. References assert(), llvm::LiveRangeCalc::extend(), getSlotIndexes(), getVNInfoAllocator(), and llvm::LiveRangeCalc::reset(). Referenced by addSegmentsWithValNo(), extendToIndices(), removeInterval(), and replaceDominatedUses(). Definition at line 186 of file LiveIntervals.h. References extendToIndices(), llvm::RegState::Kill, and pruneValue(). Definition at line 214 of file LiveIntervals.h. Definition at line 87 of file LiveIntervals.cpp. References llvm::AnalysisUsage::addPreserved(), llvm::AnalysisUsage::addPreservedID(), llvm::AnalysisUsage::addRequired(), llvm::AnalysisUsage::addRequiredTransitive(), llvm::AnalysisUsage::addRequiredTransitiveID(), llvm::MachineFunctionPass::getAnalysisUsage(), llvm::MachineDominatorsID, llvm::MachineLoopInfoID, and llvm::AnalysisUsage::setPreservesCFG(). Return the live range for register unit Unit if it has already been computed, or nullptr if it hasn't been computed yet. Definition at line 405 of file LiveIntervals.h. Referenced by getLanesWithProperty(), getLiveRange(), llvm::LiveIntervals::HMEditor::getRegUnitLI(), matchPair(), and removePhysRegDefAt(). Definition at line 409 of file LiveIntervals.h. Definition at line 230 of file LiveIntervals.h. Referenced by addKillFlags(), addSegmentsWithValNo(), llvm::createCopyConstrainDAGMutation(), definesFullReg(), llvm::SplitEditor::dump(), llvm::SplitEditor::enterIntvAfter(), llvm::SplitEditor::enterIntvBefore(), llvm::SIRegisterInfo::findReachingDef(), llvm::InsertPointAnalysis::getLastInsertPointIter(), getVRegDef(), llvm::CoalescerPair::isCoalescable(), isRematerializable(), llvm::SplitEditor::leaveIntvAfter(), llvm::SplitEditor::leaveIntvBefore(), matchPair(), llvm::printLivesAt(), regOverlapsSet(), llvm::SystemZRegisterInfo::shouldCoalesce(), shrinkToUses(), and llvm::LiveIntervals::HMEditor::updateAllRanges(). Definition at line 225 of file LiveIntervals.h. Referenced by addSegmentsWithValNo(), addSegmentToEndOfBlock(), llvm::ScheduleDAGInstrs::buildSchedGraph(), llvm::RegPressureTracker::bumpDownwardPressure(), llvm::RegPressureTracker::bumpUpwardPressure(), llvm::SplitAnalysis::clear(), llvm::createCopyConstrainDAGMutation(), definesFullReg(), llvm::RegisterOperands::detectDeadDefs(), dumpMachineInstrRangeWithSlotIndex(), findNextInsertLocation(), llvm::SIRegisterInfo::findReachingDef(), findUseBetween(), llvm::InsertPointAnalysis::getFirstInsertPoint(), llvm::getLiveRegsAfter(), llvm::getLiveRegsBefore(), getUsedRegMask(), getVRegDef(), hasOneUse(), llvm::InsertPointAnalysis::InsertPointAnalysis(), llvm::CoalescerPair::isCoalescable(), isDefBetween(), isPlainlyKilled(), matchPair(), moveAndTeeForMultiUse(), moveForSingleUse(), oneUseDominatesOtherUses(), llvm::RegPressureTracker::recede(), llvm::RegPressureTracker::recedeSkipDebugValues(), regJustKilledBefore(), rematerializeCheapDef(), repairIntervalsInRange(), replaceDominatedUses(), llvm::GCNScheduleDAGMILive::schedule(), llvm::GCNIterativeScheduler::scheduleRegion(), and shrinkToUses(). Definition at line 114 of file LiveIntervals.h. References createAndComputeVirtRegInterval(), hasInterval(), and Reg. Referenced by addKillFlags(), addSegmentsWithValNo(), llvm::RegAllocBase::allocatePhysRegs(), llvm::calculateSpillWeightsAndHints(), computeWeight(), llvm::createCopyConstrainDAGMutation(), createSegmentsForValues(), definesFullReg(), llvm::SplitEditor::dump(), llvm::SIRegisterInfo::findReachingDef(), getInterval(), getLanesWithProperty(), llvm::getLiveLaneMask(), getLiveRange(), getVRegDef(), hasOneUse(), llvm::RegAllocBase::init(), isACalleeSavedRegister(), llvm::CoalescerPair::isCoalescable(), isDefInSubRange(), isLocalCopy(), llvm::SplitAnalysis::isOriginalEndpoint(), isPlainlyKilled(), isRematerializable(), isTerminalReg(), matchPair(), moveAndTeeForMultiUse(), moveForSingleUse(), oneUseDominatesOtherUses(), print(), llvm::printLivesAt(), regJustKilledBefore(), regOverlapsSet(), rematerializeCheapDef(), repairIntervalsInRange(), replaceDominatedUses(), llvm::HexagonRegisterInfo::shouldCoalesce(), llvm::SystemZRegisterInfo::shouldCoalesce(), llvm::MachineBasicBlock::SplitCriticalEdge(), llvm::LiveIntervals::HMEditor::updateAllRanges(), and llvm::LiveDebugVariables::~LiveDebugVariables(). Definition at line 121 of file LiveIntervals.h. Definition at line 240 of file LiveIntervals.h. Referenced by addSegmentsWithValNo(), addSegmentToEndOfBlock(), llvm::SplitAnalysis::countLiveBlocks(), findNextInsertLocation(), llvm::InsertPointAnalysis::getLastInsertPointIter(), handleMove(), llvm::InsertPointAnalysis::InsertPointAnalysis(), isLiveOutOfMBB(), matchPair(), regOverlapsSet(), repairIntervalsInRange(), and llvm::SplitEditor::useIntv(). Definition at line 254 of file LiveIntervals.h. Referenced by llvm::SplitAnalysis::clear(), llvm::SplitAnalysis::countLiveBlocks(), hasPHIKill(), matchPair(), and llvm::VirtRegAuxInfo::weightCalcHelper(). Definition at line 235 of file LiveIntervals.h. Referenced by addSegmentsWithValNo(), llvm::InsertPointAnalysis::getFirstInsertPoint(), handleMove(), isLiveInToMBB(), matchPair(), llvm::MachineBasicBlock::SplitCriticalEdge(), and llvm::SplitEditor::useIntv(). Definition at line 361 of file LiveIntervals.h. Referenced by checkRegMaskInterference(), and getRegMaskBitsInBlock(). Definition at line 365 of file LiveIntervals.h. References checkRegMaskInterference(), getRegMaskBits(), and P.
Definition at line 350 of file LiveIntervals.h. Referenced by checkRegMaskInterference(), and getRegMaskSlotsInBlock(). Returns a sorted array of slot indices of all instructions with register mask operands in the basic block numbered MBBNum. Definition at line 354 of file LiveIntervals.h. It will be computed if it doesn't exist. Definition at line 392 of file LiveIntervals.h. Referenced by addKillFlags(), llvm::LiveRegMatrix::checkRegUnitInterference(), llvm::SIRegisterInfo::findReachingDef(), llvm::SystemZInstrInfo::foldMemoryOperandImpl(), llvm::LiveIntervals::HMEditor::getRegUnitLI(), isACalleeSavedRegister(), and runOnMachineFunction(). Definition at line 210 of file LiveIntervals.h. Referenced by addSegmentsWithValNo(), llvm::LiveRegMatrix::checkRegUnitInterference(), constructMainRangeFromSubranges(), llvm::SplitEditor::dump(), extendToIndices(), llvm::SystemZInstrInfo::foldMemoryOperandImpl(), isDefInSubRange(), print(), llvm::SplitEditor::reset(), llvm::GCNScheduleDAGMILive::schedule(), llvm::HexagonRegisterInfo::shouldCoalesce(), and llvm::LiveIntervals::HMEditor::updateAllRanges(). Definition at line 853 of file LiveIntervals.cpp. Referenced by computeWeight(), false::IntervalSorter::operator()(), and llvm::VirtRegAuxInfo::weightCalcHelper(). Definition at line 859 of file LiveIntervals.cpp. References llvm::MachineBlockFrequencyInfo::getBlockFreq(), llvm::MachineBlockFrequencyInfo::getEntryFreq(), and llvm::BlockFrequency::getFrequency(). Definition at line 283 of file LiveIntervals.h. References addKillFlags(), getAnalysisUsage(), handleMove(), handleMoveIntoBundle(), hasPHIKill(), intervalIsInOneMBB(), MI, llvm::RISCVFenceField::O, print(), releaseMemory(), repairIntervalsInRange(), and runOnMachineFunction(). Referenced by addSegmentsWithValNo(), addSegmentToEndOfBlock(), constructMainRangeFromSubranges(), llvm::SplitEditor::dump(), extendToIndices(), llvm::SystemZInstrInfo::foldMemoryOperandImpl(), isDefInSubRange(), print(), and llvm::SplitEditor::reset(). Call this method to notify LiveIntervals that instruction MI has been moved within a basic block. This will update the live intervals for all operands of MI. Moves between basic blocks are not supported. UpdateFlags Update live intervals for nonallocatable physregs. Definition at line 1443 of file LiveIntervals.cpp. References assert(), getMBBEndIdx(), getMBBStartIdx(), llvm::MachineInstr::getParent(), llvm::MachineInstr::isBundled(), MRI, TRI, and llvm::LiveIntervals::HMEditor::updateAllRanges(). Referenced by getVNInfoAllocator(), moveAndTeeForMultiUse(), moveForSingleUse(), llvm::GCNScheduleDAGMILive::schedule(), and llvm::GCNIterativeScheduler::scheduleRegion(). Requires MI and BundleStart to have SlotIndexes, and assumes existing liveness is accurate. BundleStart should be the first instruction in the Bundle. Definition at line 1456 of file LiveIntervals.cpp. References MRI, TRI, and llvm::LiveIntervals::HMEditor::updateAllRanges(). Definition at line 125 of file LiveIntervals.h. References llvm::IndexedMap< T, ToIndexT >::inBounds(), and Reg. Referenced by llvm::RegAllocBase::allocatePhysRegs(), createEmptyInterval(), llvm::SIRegisterInfo::findReachingDef(), getInterval(), llvm::getLiveRegs(), isLocalCopy(), matchPair(), print(), llvm::printLivesAt(), repairIntervalsInRange(), replaceRegUsesAfterLoop(), and llvm::MachineBasicBlock::SplitCriticalEdge(). This may conservatively return true to avoid expensive computations. Definition at line 838 of file LiveIntervals.cpp. References llvm::VNInfo::def, llvm::SlotIndexes::getMBBEndIdx(), getMBBFromIndex(), llvm::LiveRange::getVNInfoBefore(), llvm::VNInfo::isPHIDef(), llvm::VNInfo::isUnused(), llvm::MachineBasicBlock::pred_size(), llvm::MachineBasicBlock::predecessors(), and llvm::LiveRange::valnos. Referenced by getVNInfoAllocator(), and llvm::CoalescerPair::isCoalescable(). Definition at line 265 of file LiveIntervals.h. Referenced by addSegmentsWithValNo(), convertImplicitDefToConstZero(), moveAndTeeForMultiUse(), optimizeVcndVcmpPair(), and rematerializeCheapDef(). Definition at line 269 of file LiveIntervals.h. References E, I, and llvm::SlotIndexes::insertMachineInstrInMaps(). Definition at line 258 of file LiveIntervals.h. References assert(), llvm::MachineBasicBlock::getNumber(), llvm::SlotIndexes::insertMBBInMaps(), llvm::SmallVectorTemplateBase< T >::push_back(), and llvm::SmallVectorBase::size(). Referenced by insertInstWithExecFallthrough(), and llvm::MachineBasicBlock::SplitCriticalEdge(). If LI is live in to or out of any block, return NULL. Definition at line 814 of file LiveIntervals.cpp. Referenced by checkRegMaskInterference(), getVNInfoAllocator(), and isLocalCopy(). Definition at line 244 of file LiveIntervals.h. Referenced by llvm::InsertPointAnalysis::InsertPointAnalysis(), and matchPair(). Definition at line 249 of file LiveIntervals.h. Returns true if the specified machine instr has been removed or was never entered in the map. Definition at line 220 of file LiveIntervals.h. Referenced by findNextInsertLocation(), isPlainlyKilled(), and matchPair(). Definition at line 154 of file LiveIntervals.cpp. References assert(), llvm::LiveRangeCalc::calculate(), createAndComputeVirtRegInterval(), llvm::LiveRange::createDeadDef(), llvm::LiveRangeCalc::createDeadDefs(), llvm::dbgs(), llvm::LiveRange::empty(), llvm::LiveRange::flushSegmentSet(), llvm::SlotIndexes::getInstructionIndex(), getInterval(), llvm::SlotIndexes::getMBBStartIdx(), llvm::MachineFunction::getNumBlockIDs(), llvm::MCRegisterInfo::getNumRegUnits(), llvm::MachineRegisterInfo::getNumVirtRegs(), llvm::SlotIndex::getRegSlot(), getSlotIndexes(), getVNInfoAllocator(), hasInterval(), llvm::huge_valf, llvm::VNInfo::id, llvm::TargetRegisterInfo::index2VirtReg(), llvm::TargetRegisterInfo::isPhysicalRegister(), llvm::MachineRegisterInfo::isReserved(), llvm::MachineRegisterInfo::isReservedRegUnit(), llvm::MCRegisterInfo::DiffListIterator::isValid(), llvm::MCRegUnitRootIterator::isValid(), LLVM_DEBUG, LLVM_DUMP_METHOD, llvm::BitmaskEnumDetail::Mask(), MI, llvm::MachineFunction::print(), llvm::printMBBReference(), llvm::printRegUnit(), llvm::SmallVectorTemplateBase< T, bool >::push_back(), llvm::LiveInterval::reg, Reg, llvm::MachineRegisterInfo::reg_empty(), llvm::MachineRegisterInfo::reg_nodbg_empty(), llvm::LiveRangeCalc::reset(), llvm::SmallVectorImpl< T >::resize(), llvm::MachineRegisterInfo::shouldTrackSubRegLiveness(), llvm::SmallVectorBase::size(), and llvm::UseSegmentSetForPhysRegs. Referenced by getVNInfoAllocator(), isTerminalReg(), and llvm::MachineFunction::verify(). If LR has a live value at Kill, prune its live range by removing any liveness reachable from Kill. Add live range end points to EndPoints such that extendToIndices(LI, EndPoints) will reconstruct the value's live range. Calling pruneValue() and extendToIndices() can be used to reconstruct SSA form after adding defs to a virtual register. Definition at line 621 of file LiveIntervals.cpp. References llvm::df_ext_begin(), llvm::df_ext_end(), E, llvm::LiveQueryResult::endPoint(), llvm::SlotIndexes::getMBBEndIdx(), llvm::SlotIndexes::getMBBFromIndex(), llvm::SlotIndexes::getMBBRange(), I, llvm::SmallVectorTemplateBase< T >::push_back(), llvm::LiveRange::Query(), llvm::LiveRange::removeSegment(), llvm::MachineBasicBlock::successors(), llvm::LiveQueryResult::valueIn(), and llvm::LiveQueryResult::valueOutOrDead(). Referenced by addSegmentsWithValNo(), and extendToIndices(). This function should not be used. Its intent is to tell you that you are doing something wrong if you call pruneValue directly on a LiveInterval. Indeed, you are supposed to call pruneValue on the main LiveRange and all the LiveRanges of the subranges if any. Definition at line 204 of file LiveIntervals.h. Definition at line 108 of file LiveIntervals.cpp. References llvm::SmallVectorImpl< T >::clear(), llvm::TargetRegisterInfo::index2VirtReg(), and llvm::BumpPtrAllocatorImpl< AllocatorT, SlabSize, SizeThreshold >::Reset(). Remove associated live ranges for the register units associated with Reg. Subsequent uses should rely on on-demand recomputation. This method can result in inconsistent liveness tracking if multiple phyical registers share a regunit, and should be used cautiously. Definition at line 424 of file LiveIntervals.h. References constructMainRangeFromSubranges(), llvm::LaneBitmask::getAll(), llvm::MCRegisterInfo::DiffListIterator::isValid(), removePhysRegDefAt(), removeRegUnit(), removeVRegDefAt(), and splitSeparateComponents(). Definition at line 144 of file LiveIntervals.h. References addSegmentToEndOfBlock(), extendToIndices(), Reg, and shrinkToUses(). Referenced by llvm::RegAllocBase::allocatePhysRegs(), optimizeVcndVcmpPair(), and rematerializeCheapDef(). Definition at line 275 of file LiveIntervals.h. Referenced by isACalleeSavedRegister(), isDefInSubRange(), optimizeVcndVcmpPair(), llvm::RegAllocBase::postOptimization(), and rematerializeCheapDef(). Remove value numbers and related live segments starting at position Pos that are part of any liverange of physical register Reg or one of its subregisters. Definition at line 1611 of file LiveIntervals.cpp. References getCachedRegUnit(), llvm::LiveRange::getVNInfoAt(), llvm::LiveRange::removeValNo(), and TRI. Referenced by rematerializeCheapDef(), and removeAllRegUnitsForPhysReg(). Remove computed live range for register unit Unit. Definition at line 415 of file LiveIntervals.h. Remove value number and related live segments of LI and its subranges that start at position Pos. Definition at line 1619 of file LiveIntervals.cpp. References assert(), llvm::VNInfo::def, llvm::SlotIndex::getBaseIndex(), llvm::LiveRange::getVNInfoAt(), llvm::LiveInterval::removeEmptySubRanges(), llvm::LiveRange::removeValNo(), and llvm::LiveInterval::subranges(). Referenced by addSegmentsWithValNo(), and removeAllRegUnitsForPhysReg(). It is intended for use after target hooks that may insert or remove instructions, and is only efficient for a small number of instructions. OrigRegs is a vector of registers that were originally used by the instructions in the range between the two iterators. Currently, the only only changes that are supported are simple removal and addition of uses. Definition at line 1560 of file LiveIntervals.cpp. References llvm::MachineBasicBlock::begin(), createAndComputeVirtRegInterval(), llvm::MachineBasicBlock::end(), getInstructionIndex(), getInterval(), getMBBEndIdx(), llvm::SlotIndex::getPrevSlot(), llvm::LiveRange::hasAtLeastOneValue(), hasInterval(), I, llvm::MachineInstr::isDebugInstr(), llvm::TargetRegisterInfo::isVirtualRegister(), MI, llvm::MachineInstr::operands_begin(), llvm::MachineInstr::operands_end(), and llvm::LiveInterval::subranges(). Referenced by getVNInfoAllocator(), and llvm::MachineBasicBlock::SplitCriticalEdge(). Definition at line 279 of file LiveIntervals.h. Referenced by addSegmentsWithValNo(), definesFullReg(), insertInstWithExecFallthrough(), and regOverlapsSet(). Definition at line 125 of file LiveIntervals.cpp. References llvm::Pass::dump(), llvm::TargetSubtargetInfo::getInstrInfo(), llvm::MCRegisterInfo::getNumRegUnits(), llvm::MachineRegisterInfo::getNumVirtRegs(), llvm::MachineFunction::getRegInfo(), llvm::TargetSubtargetInfo::getRegisterInfo(), getRegUnit(), llvm::MachineFunction::getSubtarget(), and LLVM_DEBUG. After removing some uses of a register, shrink its live range to just the remaining uses. This method does not compute reaching defs for new uses, and it doesn't remove dead defs. Dead PHIDef values are marked as unused. New dead machine instructions are added to the dead vector. Returns true if the interval may have been separated into multiple connected components. Definition at line 441 of file LiveIntervals.cpp. References llvm::MachineInstr::addRegisterDead(), llvm::MachineInstr::allDefsAreDead(), assert(), llvm::LiveRange::begin(), createSegmentsForValues(), llvm::dbgs(), llvm::tgtok::Def, llvm::VNInfo::def, llvm::LiveRange::end(), llvm::LiveRange::FindSegmentContaining(), llvm::SlotIndex::getDeadSlot(), getInstructionFromIndex(), getInstructionIndex(), llvm::LaneBitmask::getNone(), llvm::SlotIndex::getRegSlot(), I, llvm::VNInfo::isPHIDef(), llvm::VNInfo::isUnused(), llvm::TargetRegisterInfo::isVirtualRegister(), LLVM_DEBUG, llvm::make_range(), llvm::VNInfo::markUnused(), MI, llvm::SmallVectorTemplateBase< T, bool >::push_back(), llvm::LiveRange::Query(), llvm::LiveInterval::reg, llvm::MachineRegisterInfo::reg_instructions(), llvm::LiveInterval::removeEmptySubRanges(), llvm::LiveRange::removeSegment(), llvm::LiveRange::segments, llvm::MachineInstr::setRegisterDefReadUndef(), llvm::MachineRegisterInfo::shouldTrackSubRegLiveness(), llvm::LiveInterval::subranges(), llvm::SmallVectorImpl< T >::swap(), UseMI, llvm::LiveRange::valnos, llvm::LiveQueryResult::valueDefined(), llvm::LiveQueryResult::valueIn(), llvm::LiveRange::vni_begin(), and llvm::LiveRange::vni_end(). Referenced by removeInterval(), replaceDominatedUses(), and shrinkToUses(). Specialized version of shrinkToUses(LiveInterval li, SmallVectorImpl<MachineInstr> *dead) that works on a subregister live range and only looks at uses matching the lane mask of the subregister range. This may leave the subrange empty which needs to be cleaned up with LiveInterval::removeEmptySubranges() afterwards. Definition at line 542 of file LiveIntervals.cpp. References assert(), createSegmentsForValues(), llvm::dbgs(), llvm::VNInfo::def, llvm::LiveRange::Segment::end, llvm::SlotIndex::getDeadSlot(), getInstructionIndex(), llvm::SlotIndex::getRegSlot(), llvm::LiveRange::getSegmentContaining(), llvm::TargetRegisterInfo::getSubRegIndexLaneMask(), llvm::VNInfo::isPHIDef(), llvm::VNInfo::isUnused(), llvm::TargetRegisterInfo::isVirtualRegister(), llvm::LiveInterval::SubRange::LaneMask, LLVM_DEBUG, llvm::make_range(), llvm::VNInfo::markUnused(), llvm::SmallVectorTemplateBase< T, bool >::push_back(), llvm::LiveRange::Query(), llvm::LiveRange::removeSegment(), llvm::LiveRange::segments, SubReg, llvm::SmallVectorImpl< T >::swap(), llvm::MachineRegisterInfo::use_nodbg_operands(), UseMI, llvm::LiveRange::valnos, llvm::LiveQueryResult::valueDefined(), llvm::LiveQueryResult::valueIn(), llvm::LiveRange::vni_begin(), and llvm::LiveRange::vni_end(). Definition at line 1637 of file LiveIntervals.cpp. References llvm::ConnectedVNInfoEqClasses::Classify(), createEmptyInterval(), llvm::SmallVectorTemplateCommon< T >::data(), llvm::dbgs(), llvm::ConnectedVNInfoEqClasses::Distribute(), I, LLVM_DEBUG, MRI, llvm::SmallVectorTemplateBase< T >::push_back(), and llvm::LiveInterval::reg. Referenced by removeAllRegUnitsForPhysReg(), and shrinkToUses(). Definition at line 99 of file LiveIntervals.h.